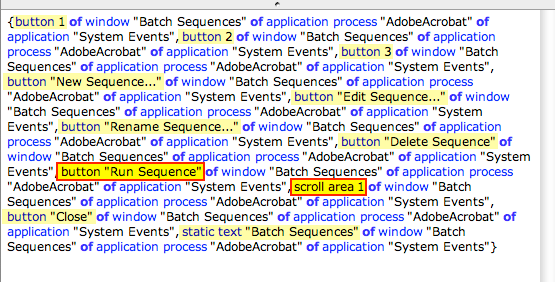 some applications have poor scripting support — acrobat is a shocker. have a look at the acrobat scripting dictionary to see just how restricted the opportunities are — even for the pro version. but it IS still possible to automate acrobat through GUI (graphical user interface, or gooey) scripting. GUI scripting has been available since OSX 10.3 (panther) and uses system events to, basically, activate menus, open windows and click buttons in the same way that you would using a mouse. 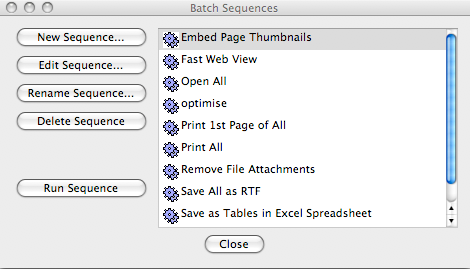 this post will outline a process for working out just one example — running a batch sequence from the advanced menu. but hopefully you’ll glean enough information to be able to adapt what’s here for other scripts too. tell menu bar item "Advanced"
tell menu item "Document processing"
click menu item "Batch Processing..."
tell menu bar 1 of process "Acrobat"
tell menu "Advanced" of menu bar item "Advanced"
tell menu "Document Processing" of menu item "Document Processing"
tell window "Batch Sequences" of process "Acrobat"
bingo! first we have to open the batch sequences window, then select row 4 of outline 1 of scroll area 1, then click the run sequence button. phew! now you can see why GUI scripting is only used as a last resort. there are third party products which make it easy to drill down through the various UI elements. and apple provide a free accessibility inspector with its developer tools or the, also free, UI elements inspector. but why do things the easy way when you can have sooo much fun working it out the hard way? This entry was posted in adobe, applescript and tagged acrobat, adobe, applescript, automation, GUI, how to, scripting, system events, tutorial by macgrunt. Bookmark the permalink. I added the script in the actions folder scripts, and it works (well ,…more or less). Another thing that I have to depurate is that once the action is finished, it appears a dialog window informing me that the file has been saved in de Desktop folder, and I have to click “OK”… is it possible to avoid this step by closing the pdf automatically?? Is it possible that I save the action running on my computer and share the video with you by email to show all this issues? You’re doing a great job. UI scripting is not an easy thing to attempt as your first Applescript. You should first get the basic applescript running correctly — so that you are happy with it — THEN turn it into a folder action. Definitely don’t try to debug this script when it is running as a folder action — that is way too hard. So far your script only opens the window “Acción: Pelicula Clondalkin” — that’s all it does. The command get UI elements is used in Applescript Editor to find out (in the results window) which elements within the window you can select, or click on, or whatever. So, at the very least, you’ll need to have the script click a button within that window to make the action run. And, yes, I expect you will be able to get the script to click that “OK” button at the end too. You can certainly email me directly — no problem at all — happy to help out any way I can. i think that this post is super-interesting. I´m trying to apply it to my Acrobat Pro X, running OSX 10.6, but I can´t access the actions wizard window. Please could you help me to get the applescript code to do it? the I could get the UI elements to continue. Things have changed a bit since I wrote this post. 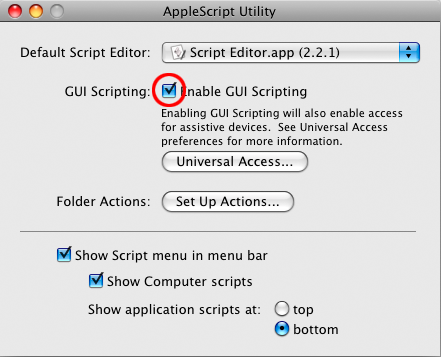 To enable GUI scripting now you need to go to your System Preferences > Universal Access and check the box at the bottom “Enable access for assistive devices”. Hi M. for your quick response! But then I get this error message telling : “it is not possible to obtain window \”Editar acciones\” of process \”Acrobat\”.” number -1728 from window “editar acciones” of process “Acrobat”. As you has observed, this is my first experience with applescript. would you be so kind yo help me with this? Welcome to the world of scripting. It can be very frustrating, but very rewarding as well. Perhaps the syntax is different for that window (?). But if you are trying to activate an existing action, you do not need to open the Editar acciones window. Do you need help just with the script, or also with setting up the folder action?